Beautiful Lucy! Live the richness of the ribbon against the kraft! Have fun with your sister! 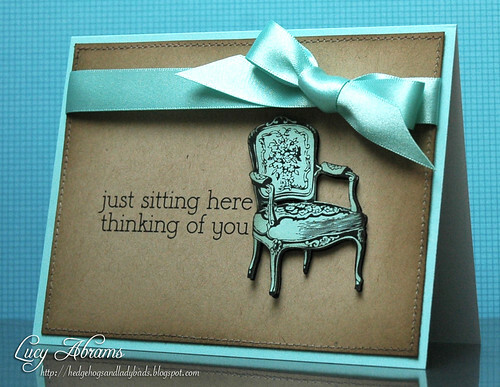 Totally fabulous card just love that chair... Have a nice hols with your sister. Yummy is the perfect word for this card! Wonderful color combo! Have a fun week off and a fab time with your sister! Beautiful card Lucy! Have a wonderful weekend! Just sitting here and enjoy looking at your new beautiful creation! That beautiful rich ribbon is the perfect thing to add to this lovely design! Just beautiful! I LOVE the colour combo. U oughta upload this to to two peas gallery and tag it, there are no examples on there at the mo! this is so elegant and classy, Lucy! love love it! have a wonderful time with your sister visiting! Beautiful! and enjoy your holiday!